I thought it would be fascinating to find out what books have most inspired some of the world's most prominent SEO professionals and content marketing experts. welcome to the 14th session of the Content Champion Podcast. This time round I'm talking small business content marketing with inbound and content marketing professional Marcus Sheridan of The Sales Lion. Hi guys, it's time for the 13th session of the Content Champion Podcast. On the show this time round is Steve Scott, the best selling author on the Amazon Kindle platform. OK folks, it's time for edition 12 of The Content Champion Podcast. In this show, I'm delighted to introduce professional SEO and super affiliate Jacob King. Welcome to the 11th session of The Content Champion Podcast. This time round, I had a fascinating and entertaining chat with Richard Marriott, the creative SEO and online entrepreneur behind the great new blog Clambr.com. For the tenth session of the Content Champion Podcast, I was lucky enough to speak for an hour with Brian Dean, the SEO expert behind Backlinko.com - my new favourite blog. 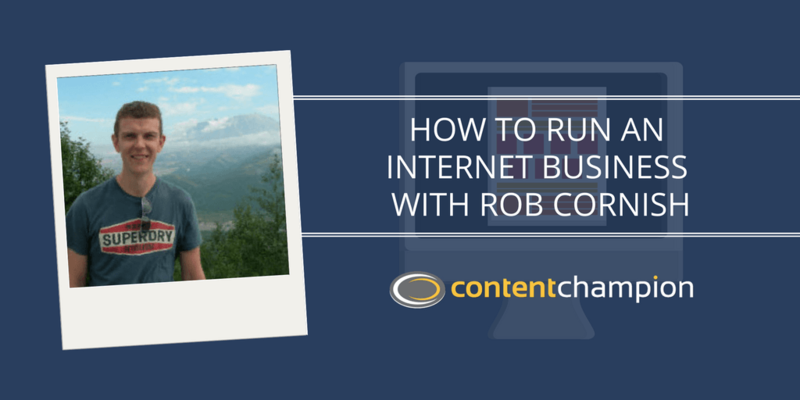 Hi folks, I've got a real treat for you in the ninth edition of The Content Champion Podcast, Rob Cornish of Gain Higher Ground gives you everything you need to know to set up and run a sustainable online business. “Story isn’t a flight from reality but a vehicle that carries us on our search for reality.” Robert McKee. Hi guys, I can't believe we're already on to the 8th session of the Content Champion Podcast. This time I'm delighted to be chatting with Steve Kamb of Nerd Fitness. In this article I'm going to share my proven template for writing affiliate product reviews for Amazon review sites. Once you've been through this post you'll have all the information you need to write engaging reviews that convert into sales. Hi folks, welcome to the 7th session of the Content Champion Podcast. In this edition I'm very happy to be talking with Lisa Parmley, online entrepreneur and renowned SEO expert. Hi Guys, welcome to the 6th session of the Content Champion Podcast. This time I'm thrilled to be joined by Corbett Barr, founder of Fizzle and expert on how to build a thriving and profitable online audience. Welcome to the 5th edition of the Content Champion Podcast. For this session I'm delighted to be joined by traffic and conversion expert Peep Laja to chat about content creation, traffic generation and conversion optimization. I'm delighted to be chatting with experienced marketing consultant Liz Lockard in the fourth session of the Content Champion Podcast. Liz helps small business owners to reach out more effectively to their target audience on the Web. I'm thrilled to be talking with Shane Melaugh in the third session of the Content Champion Podcast. Shane is the creator of some excellent software products – including Thrive Themes, Thrive Architect and Thrive Leads (all of which I own). I'm delighted to welcome you to the second Content Champion Podcast! This time I'm speaking with serial entrepreneur Neil Patel of QuickSprout fame. I'm very excited to welcome you to the very first Content Champion Podcast! To mark this event I've lined up an inspiring interview with John Lee Dumas of EOFire & The Freedom Journal. Want More Traffic, Leads & Sales?